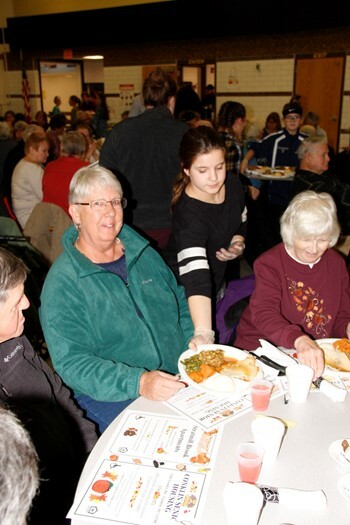 Richard T. Stank Middle School hosted its annual Thanksgiving Luncheon for community senior citizens November 14 in the newly renovated cafeteria. Music from the 7th and 8th grade flute quartet greeted guests as they arrived for the annual feast. A bustling collection of students, faculty and cafeteria staff cooked and served the turkey and all the trimmings meal, including more than 25 members of the RTS Student Council. Entertainment was provided by the RTS Middle School Jazz Band. Guests received treats from the Family and Consumer Sciences (FACS) Club as parting gifts. More than 220 sit-down and take-out lunches were served. We hope you'll join us for the Senior Citizens Holiday Luncheon coming up December 18, 1:00 p.m.